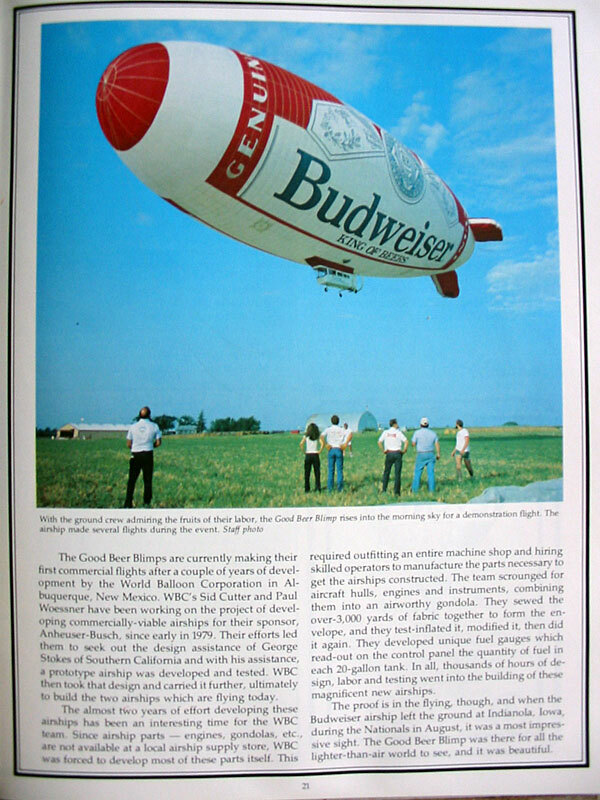 In 1979, World Balloon of Albuquerque, New Mexico developed a hot air airship which aimed to revolutionize the world of airship advertising. Two envelopes were commissioned from George Stokes, and a gondola built to match. 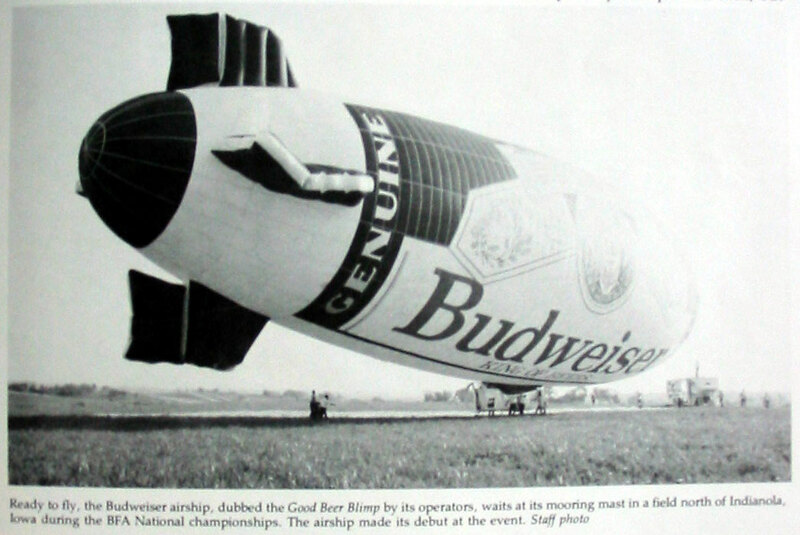 One envelope advertised Busch Beer and the sister ship was decked out in the Budweiser scheme. The gondola was built from the stripped-down fuselage of a Cessna 337 Skymaster. The front engine was removed along with all nonessential gear. The rear engine, a Lycoming 180hp, was converted to run on propane. Two Raven HPI "Square Shooters" were mounted above a Raven superpressure fan which maintained the envelope's shape. The envelopes each had a volume of 229,000 cubic feet and were 175 feet long, with a fineness ratio of 3.5:1, similar to the Goodyear Blimps. A catenary suspension system supported the gondola from the upper surface of the envelope, and a fabric bulkhead separated the envelope into compartments to provide for pitch control. The horizontal stabilizing fins had elevator surfaces, but these proved ineffective. 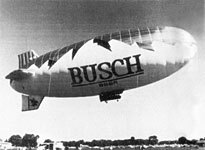 The airships suffered from pitch instability and a myriad of other problems, and were retired from flight after a short service lifetime. 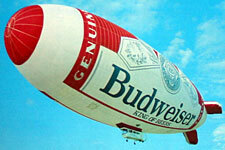 They were eventually donated to the Anderson-Abruzzo International Balloon Museum in Albuquerque. The gondola can be seen on display there. The Budweiser and Busch airships that Sid Cutter operated in 1979/80 were built by George Stokes. 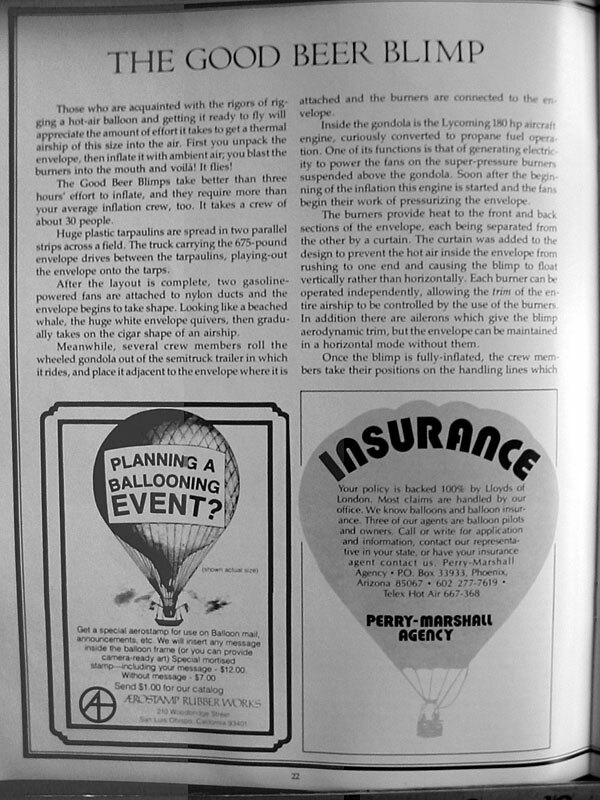 I flew them for about a year and we had nothing but problems... Balance on gondola, catenary curtains were installed, fabric going porous, any kind of wind was major problems, burned huge amounts of fuel. If you ever got it in a nose high configuration, it would stay there until you removed all power and let it cool. I was flying in it when we did that the first time and the seat lock let go and I slid all the way to the back of the gondola. For a nanoseond I thought I would slam through the rear of the cab and out into space! Sid's used a converted Cessna 337 fuselage with the forward engine removed and redesigned to look like an airship gondola. Still used the Continental 180 HP engine(? ), but run on propane. It used a Raven Super Pressure fan mounted directly over the gondola. The fan was operated by a hydraulic motor. It took a lot of work to get the gondola to mate with the envelope! 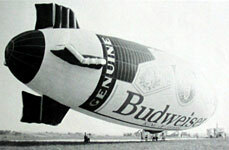 It would look good when it was fully inflated, but when it got soft the gondola would hang about 12 to 18 inches below the envelope. 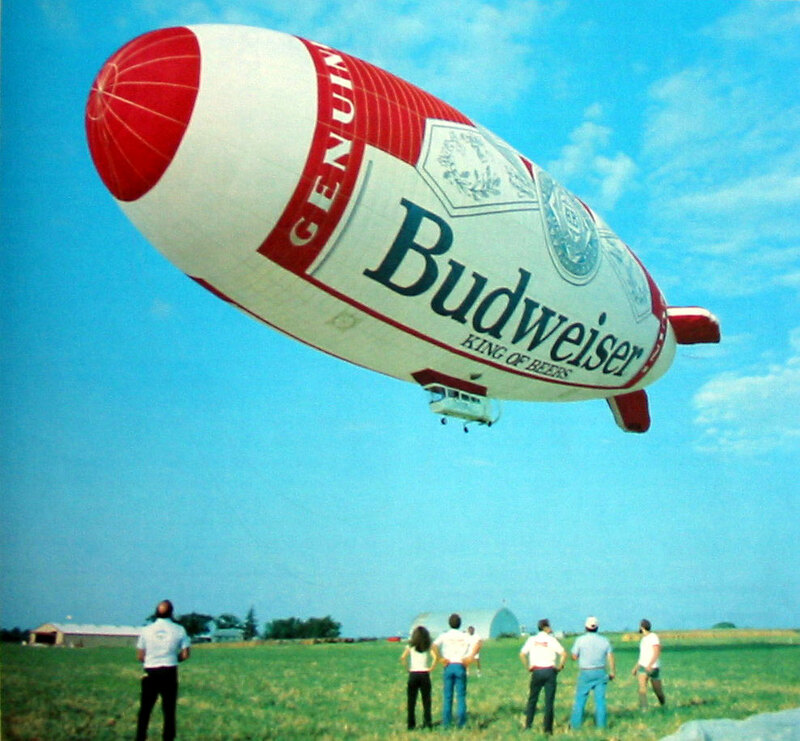 I do not know for sure, but these airships may have been the reason that Sid lost the Budweiser contract? 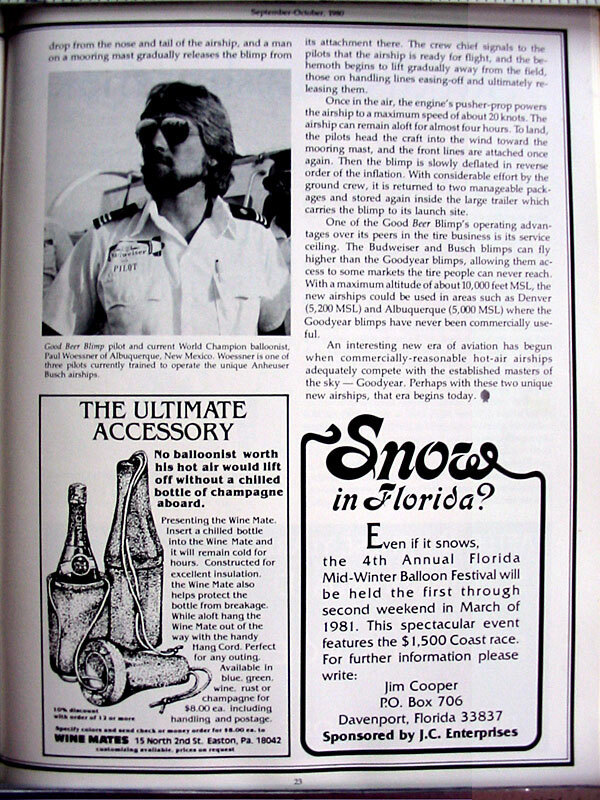 After 27 or 28 years I have forgotten most of the fun we had, but do remember flying at the World Aerobatic Championships at Oshkosh in 1979? On the World Airships, I was one of the pilots when we did our "speed run." We could only get the ship up to a little better than 30mph. Even though the ship was super pressure, the nose would start to cave in and then she would fly rather crazily. This was very much a developmental process and a learning one as not much had ever been done with hot air airships. I believe the Balloon Museum in ABQ now has the gondola and envelopes and quite a bit of the gear. I know that Wayne Bond had all of that stuff a few years ago, and I think he donated it to the museum as a tax write off? The Cessna airframe was stripped down, but we still used most of the orginal panel, seats, seat rails, no controls from the plane. We did use rudder and elevator control lines, but they were pretty much ineffective. Lift was generated by the burners...Raven HPI superpressure built as dual burners. The ship was about 200,000 cubic feet in displacement with a 3.5 to 1 fineness ratio. You are really testing my memory as it has been 27 years since I flew these ships. That is not a complaint, but just an observation! Your questions make me think back and sometimes the old memory just is not up to the task. The instability was a function of the nose deforming into an irregular shape and then continually changing. A later addition was a curtain to split the forward and rear compartments of the envelope as if you added a lot of heat and got into a nose high attitude the nose would keep rising (hot air rises...duh!). The mooring mast was an intergal part of the trailers we used. 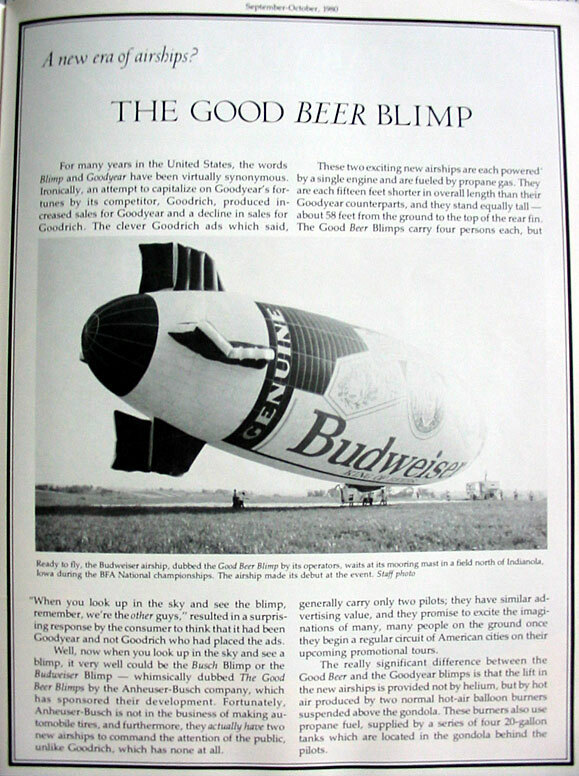 If the airship was inflated, it was moored to the mast! We were very concerned about it getting away from us in wind! Many of the flights were done at all hours of the day. It was not unusal to be up at 1 or 2 in the afternoon. What did we know about thermals???? Not much!! Another story for you. We were at Indianola in 1979??? flying from an airfield to the north of town. We blew a catenary curtain in flight and landed in a pasture about a mile away. When the crew showed up, we had a Mexican sewer with us named Ernie and he found an old patch of hemp. He wanted to leave all the balloon stuff in the field, fill up the trailer with the hemp plants and bring them back to ABQ. We told him that you could not get high on hemp, but he swore his friends would pay $100 a pound for it and would not know the difference! Needless to say we did not cooperate with Ernie.